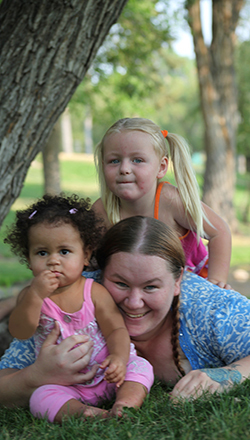 Jessica had completed a few years of college before she moved to Billings a few years prior, and she decided to go back to school at Montana State University – Billings while living at Harmony House in order to finish her bachelor’s degree. When she found out there was a college major that was dedicated to helping people, she decided to change her major to Human Services because she had been inspired by all of the help and support from the HRDC staff. Six months after becoming Harmony House’s first successful graduate, she went back and become the first successful intern the program had. She graduated from MSU-B in 2012 with her bachelor’s degree. She took a job at Gateway House, a shelter for victims of domestic violence, as a domestic violence advocate. “I remember her telling me that she wanted to be able to give back to the community because she felt she had received so much support,” Terri recalled. During this time, Jessica met the man who would become her husband and she now has three beautiful daughters. In 2014, she was offered the position of Library Director of the Meagher County City Library and moved her family to White Sulphur Springs. She thrived in the job. Even though she had a family and full time employment, she decided to continue her education and is currently pursuing a Master’s Degree in Public Administration from Ashford University.